Grower’s Secret sells both traditional and organic fertilizers based on specific mushroom combinations, all of which are designed to sustainably increase agricultural productivity. The seeds of the company were planted back in 1995, and it currently sells four unique, highly specialized products that literally help its clients grow. Grower’s Secret has been a longtime client of LyntonWeb, making working together a natural choice for the website redesign. No longer focused solely on distributors, Grower’s Secret wanted to revamp its site to appeal to farmers. The company envisioned the new site as a generous resources center, with more streamlined, straightforward navigation and less overall confusion. Clean product pages were another element essential to success, with the existing site making it difficult to even find the products for sale. Grower’s Secret collaborated with LyntonWeb on ideas concerning what content to include per page, and LyntonWeb got busy generating templates with the company’s branding applied. Since the existing site and new site were both on the HubSpot platform, LyntonWeb was able to use an existing template to streamline template development. We were also able to make iterations to the revised template, speeding up the process even further. The finished result aligns with Grower’s Secret original vision: an easy-to-use, resource center stocked with content useful to agricultural professionals. 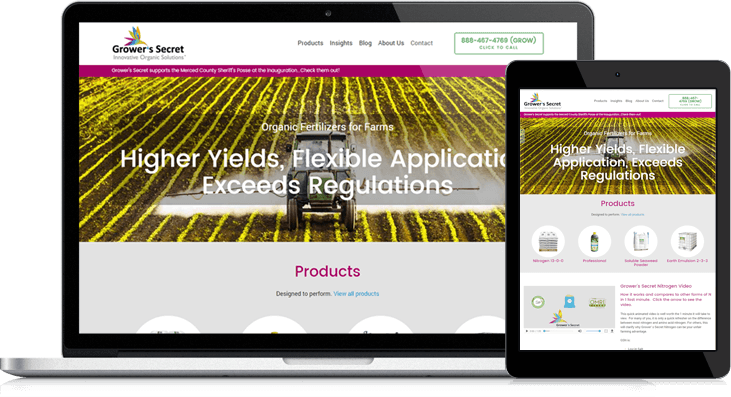 Grower’s Secret aims to use the new website within its marketing efforts as a reference point, both in the sales and account management arenas. The simplified content, clean feel and user-friendly navigation ensure the site is a useful tool for building and growing relationships with farmers.